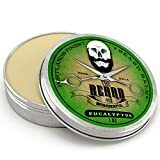 Eucalyptus Beard taming Balm for ALL HAIR TYPES containing a perfect blend of butters and oils to tame and train wild beard hairs. REDUCE ITCHING PATCHINESS & IMPROVE GROWTH Tame unruly facial hair and keep beard and skin underneath moisturised. Stimulates fast Growth, Health, and Strength, helps prevent Itching, Dry Skin, Split Ends and eliminates beard-druff. Your Beard and Tache NEED THIS BALM! 100% Natural Organic Ingredients such as shea butter, Hemp & Jojoba oils and beeswax. Handmade in the UK. EASY TO USE 2-in-1 Beard Conditioner and Styling product, conditions your facial hair nourishing from the inside using just a small amount massaged between the fingers and massaged in from root to tip. LIFETIME GUARANTEE AND LOWEST PRICE Comes in BIG 30ml Tin at a really Low Price. TWICE the size of other balms that cost more! 2) Tames Wild hairs – Adds weight to the beard to bring those annoying stragglers into line! Our Beard Balm contains premium natural ingredients including Shea Butter, Jojoba Oil, Hemp Oil, and Beeswax, Sweet Eucalyptus oil. NO PRESERVATIVES, NO ADDITIVES, NO JUNK. Made to a perfected formula right here in the UK by experienced artisans under strict quality controls to give the best product possible!. Guaranteed to be the BEST you will ever use! BIGGER, BETTER and CHEAPER than the REST. Not just another Beard Balm, but the BEST Beard Balm. You CANNOT put anything better on your hair and skin! We are so sure you will love our Beard Balm and it is the best on the market, that we have backed it up with a 100% Money Back Guarantee! Balm Usage Directions: Scrape out a small amount of balm, Put the balm between your fingers and warm it up until it softens to a thick warm liquid, Apply the goo to your beard and mustache rubbing into the hairs and skin. Start from the neck and work upwards getting into the roots. Finally comb through the beard and move/smooth it into the desired shape. This entry was posted in Organic Health Products and tagged 30ml., Balm, Beard, Best, Conditioner, Eucalyptus, Large, LeaveIn, Natural, Organic, Quality, Scent, Softening, Taming, Value by Organic Health. Bookmark the permalink.